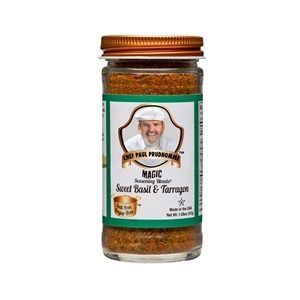 Formerly named "Seven Herb", this is an excellent seasoning for the richer flavors of meat, pork and seafood. Sweet Basil & Tarragon features an intriguing blend of bell peppers, chili peppers, herbs, onions and garlic. It delivers a well balanced flavor that works well on all your favorite dishes and in all your favorite recipes. No Preservatives Salt Free and Sugar Free MSG-Free and Gluten-Free Kosher and Halal approved NO SALT SUBSTITUTES! Only 10 mg of natural potassium per serving. Ingredient: Bell peppers, chilies, onion, basil, tarragon, garlic, tamarind flavor, maltodextrin, palm oil, stevia extract.